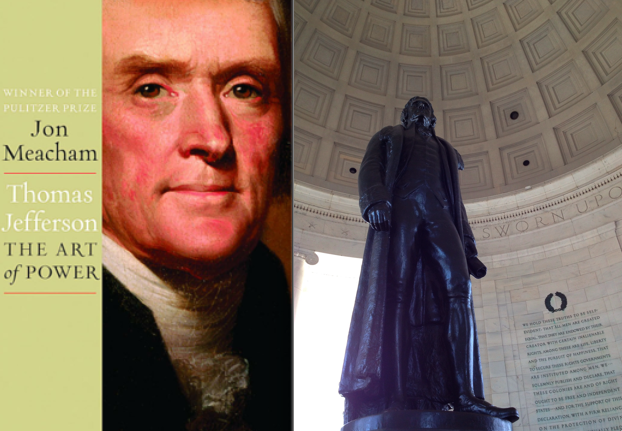 Thomas Jefferson has always fascinated me more than any other politician and most other men. He was an inventor, an avid reader, and a brilliant writer. He started a college, helped America gain independence and then served as the Vice President and then President. He loved wine, travel (especially to France) and staying active. He built an incredible home and gardens. He was a good friend and host, a loyal husband and loving father and grandfather. Meacham paints Jefferson’s life in broad strokes. From his early days when he become the man of the house after losing his father at the tender age of 14; to his days as President when our country doubled in size thanks to the Louisiana Purchase. Jefferson’s wife died young after bearing him too many children too quickly. Though he was only in his 30s, he made a promise never to remarry, which he kept. Later he had a relationship that lasted for decades with a slave, Sally Hemings, who was actually his wife’s half sister. One thing I learned from the book is that American politics have changed very little in the past 200 years. There were people that thought America was going to hell because Jefferson was elected. Others thought that Adams would be its downfall. There always seems to be someone willing to do something dirty for politics and others who are truly trying to further the interests of the country as a whole. It’s good to have some perspective, things are rarely as bad as we think. BOTTOM LINE: This is such a well-done biography. It’s fair and honest. It doesn’t shy away from tough issues, but it doesn’t needlessly focus on them. It is a portrait of the life of an incredible man. The only reason this is a 4.5 instead of a 5 is because I have never felt the desire to re-read a biography. I only give 5 stars to books I know I will re-read. 1) Never put off to tomorrow what you can do today. 2) Never trouble another with what you can do yourself. 3) Never spend your money before you have it. 4) Never buy a thing you do not want, because it is cheap, it will be dear to you. 5) Take care of your cents: Dollars will take care of themselves. 6) Pride costs us more than hunger, thirst and cold. 7) We never repent of having eaten too little. 8) Nothing is troublesome that one does willingly. 9) How much pain have cost us the evils which have never happened. 10) Take things always by their smooth handle. 11) Think as you please, and so let others, and you will have no disputes. 12) When angry, count 10, before you speak; if very angry, 100. I thought this bio was fantastic :) It made me like Jefferson, as a politician, even more. Jennifer - Me too! I couldn't believe how much he'd accomplsihed by a young age. Love the advice at the close of your post -- and this definitely sounds like a wonderful portrait of Jefferson! I must confess to never having read a presidential biography... might be time to change that! Meg - Some bios can be really dry, but I thought this one was incredibly well done. Yeah the last one I read about Jefferson was "American Sphinx" by Joseph Ellis, which was pretty interesting. But the Meacham one sounds like a good bio. cheers. thecuecard - I'll have to check that one out. Jefferson's life has always fascinated me.